1. Insert the power cord into AC120V socket and then turn on the main power switch. 2. The power indicator (green) gives light and indicates the studio light is charging normally. 3. When the charge indicator (red) gives light, the Photocell is ringing and indicates the voltage is at 80%. After several minutes, the voltage will achieve the full power range. Switch Upward ( - ) : Modeling lamp continuously gives light with full range. Switch to the Middle ( o ) : The lamp is off. Switch Downward ( = ): Modeling lamp will give off light and the light will change with the flash power simultaneously. 5. The guide number will locate the variator in any place according to the request of locating light so as long as you can get the liable output. Wireless flash trigger (transmitter) & receiver set is required. Trigger connects to the camera hot shoe and receiver connects to the flash strobe. Sync terminal adapter with standard PC-type cable port is required. 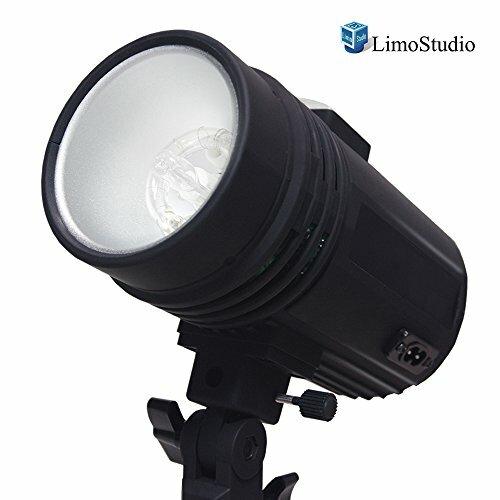 The flash strobe connects directly to the camera with included cable.